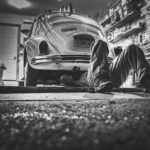 The conditions of your garage or workshop can make all the difference when you’re trying to get work done on your latest project. We all know how frustrating it is to try and concentrate in hot, stuffy conditions – so don’t let that get in the way your productivity. Keep your space freshly ventilated with these garage fans – ensuring the only thing you have to worry about is remembering to stop for dinner. Each of these fans has made our top recommendation list because they’re durable and high-quality products. We’ve compared and contrasted them to outline what they’re especially good at (i.e. portability vs. raw power) – so that you can quickly find one that will suit your needs. We have no hesitation in saying that our #1 recommendation is the Vornado 293. Our top recommendation – the Vornado 293. On top of all that, it’s made in the USA – and the 5-year warranty isn’t just a sales point. Vornado is well known for their fantastic customer service – and their products are made to last. The only issue is that the fan isn’t made to directly blow air at you. It cools the entire room down through rebounding the air so that it flows around the whole space. See our dedicated Vornado guide for more info on how they work. 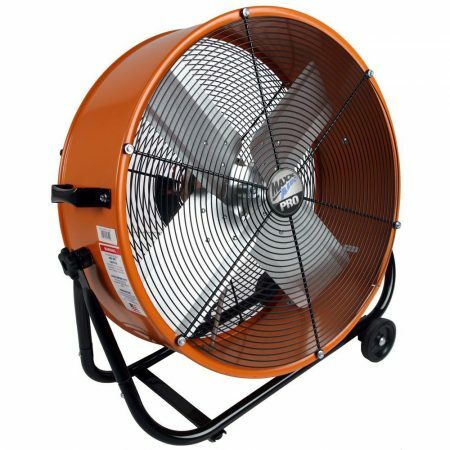 As long as you don’t need a specifically direct airflow, however, this is undoubtedly the best garage fan on the market – in our opinion. Check out the Vornado 293 on Amazon here. In this section, we cover the most important things to consider when searching for which product to buy. If you already know what kind of garage fan you’re looking for – you can skip straight to the reviews. Especially when shopping online, it can be hard to know which product is worth your money. With that in mind, we’ve provided a quick run-down of what changes from model to model. Have a read, and try to see what’s most important to you. Then, look for a garage fan that has the best of those qualities. Starting with the obvious – consider how much power you’re looking for. Will you be regularly ventilating out fumes, or just need a bit of extra airflow/cooling? There are fans for every purpose – with the OEMTOOLS model (at our #2 spot) being the most powerful of the lot. The exterior of a good garage fan should be unquestionably durable. You should have no qualms about hauling the fan around in order to place it where you need it, and not worry about accidentally knocking it against things. Look for as much metal or heavily durable plastic as possible. A good warranty is extra-important for products that get used in workshop environments. Unlike indoor fans, these models need often endure dust, cold and hot temperatures, and meet higher demands for power and functionality. Not to mention all the bangs and knocks they can take. It’s always worth a quick check to see exactly what is covered under a warranty, and how long it lasts for. In fact, our first and last product recommendations got their places based on their warranty lengths. As well as giving you peace of mind, a good warranty is a statement by the company – showing their commitment to us, the customers. Top brands often have the best customer service and warranties, since they have a reputation to uphold. If the product is coming from a smaller company, make sure to understand the terms fully. They might not be such a ‘well-oiled machine’ when it comes to product returns and customer support. Often overlooked, the length of a fan’s power cord can play a huge role in how easy it is to use. You don’t want to set the fan up, only to find that you can’t position it where you want due to a short power cord and an awkwardly placed power socket. Look for cord length in the product specifications, and have a quick double check to make sure it won’t be an issue. Where notable, we’ve made sure to touch on cord length in our reviews. This is the reason you shouldn’t be using just any old fan in a garage or workshop. 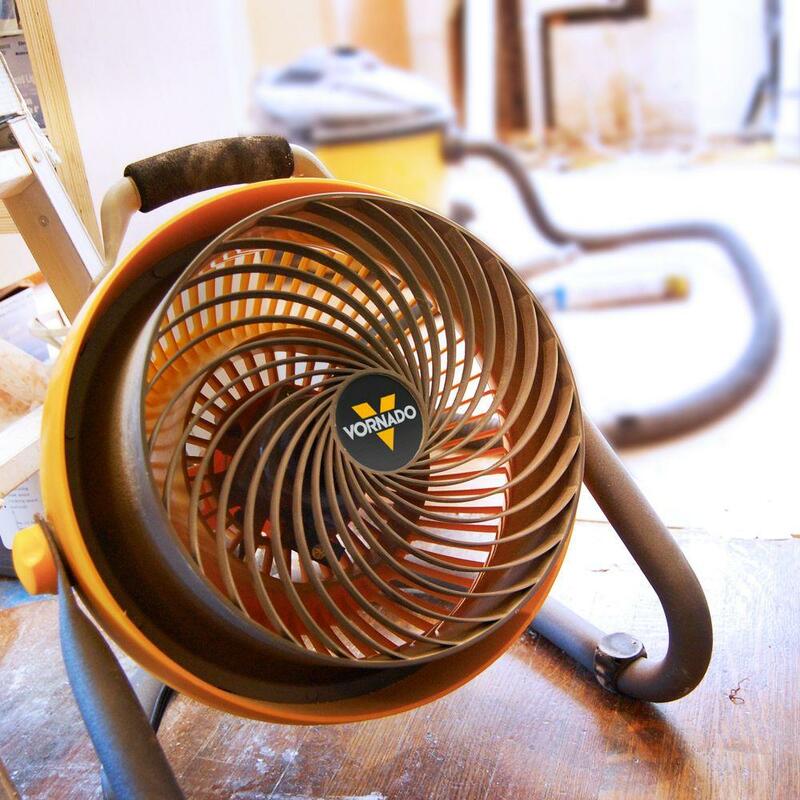 Dust, water, and contaminants can quickly wear a fan’s motor down. Look for fans that have some form of protection to shield their motor. How simple is the fan to use? Check how many speed settings it has and if the fan can rotate to open up more positional options. If you’ll regularly be re-positioning the fan, it’s important to consider it’s portability. While these fans will never be feather-light, look for models that have grips or handles to help you lift them. After some serious maneuverability? 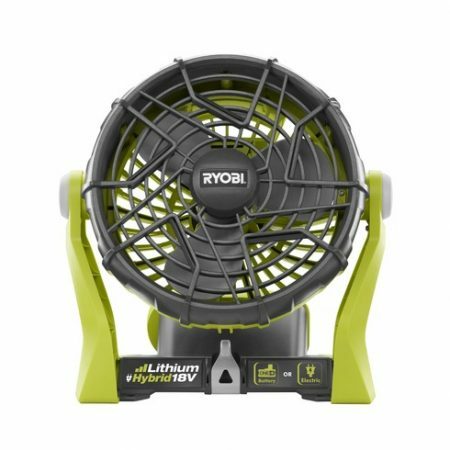 Check out the Ryobi fan in the reviews below. It can be operated using just batteries alone, making it ideal for travel or just shifting it around the garage. Unbeatable warranty, quality, and usability - the Vornado 293. This fan was an easy choice as our top pick. Because you can tell it’s really been designed with the customer in mind. We’ve found no other garage fan which has as much functionality. A 10-foot power cord, easily wall mountable fan with a carrying handle and three airflow speeds (the standard is just 2, for whatever reason). Throw in the dust-resistant motor, which is made in the USA motor and with a 5-year warranty on the entire product – and you’ve got an unbeatable deal. Especially at a price that’s equivalent to the competition. The above makes this our top recommendation, hands down. And that’s without even considering that this is a Vornado fan. Their unique air circulation technique provides an amazing amount of cooling throughout the entire garage or workshop space. If you’re not familiar with how Vornado fans work, check out our dedicated Vornado guide. (No, we’re not sponsored by them! We just love their products). An easy choice as our top pick. This Vornado fan has unbeatable quality. For a price equal to the competition, you get a longer warranty, a dust-resistant motor, and Vornado’s unique air circulation technique. All in a USA-built product. In our opinion, you really can’t get better than that. This is one powerful fan. And boy does it let you know it. 9,230 cubic feet per minute of power, to be exact. OEMTOOLS’ barrel fan holds nothing back – the amount of air output this thing can displace is pretty incredible. Ideal for any large or industrial uses, it’s sturdy case and metal blades look to last for years to come. While it packs plenty of punch, it’s also pretty loud. However, for the kind of long-term and industrial level uses this fan was made for – we think a bit of noise is more than understandable. The wheeled bracket the fan is mounted on is definitely required. Weighing in at 34 lbs means this powerhouse is best suited to static use. With that in mind, the 6-foot long power cord helps to make sure you can get it into the perfect position. However, we are limited to just two-speed settings – which leaves you to decide between a good breeze or a hurricane wind. This is fairly standard for these industrial type of fans, but even just one more speed setting would go a long way to making this fan more user-friendly. If power is your top priority, this is easily one of the strongest fans on the market. It’s quite noisy, it’s heavy, and it’s only got two-speed settings. But boy does it kick up some amount of airflow. The sturdy build quality also means this fan will be providing you with mini indoor tornados for years to come. Born to roam – easily the most portable fan on our list. 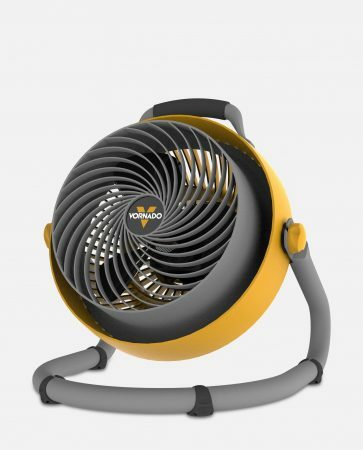 When it comes to portability, this Ryobi fan is one of the most portable fans we’ve seen. Made to function using Ryobi’s 18V battery packs, this fan is perfect for jobs that need regular maneuvering around, or even taking on the road with you. With a full wall-mount kit included, this product is really made to work anywhere. The fan is decently sturdy, and while it’s without an ultra-strong exterior and motor protection, the 3-year warranty offered by Ryobi goes a long way to make up for that. However, there’s a bit of a catch. Neither a battery pack or an extension cord is included. This is, understandably, due to Ryobi having a large range of products which work using their batteries. With that in mind, they don’t want to force you to pay for another battery if you already own one. But if you need to pick up a battery, they’re not cheap – around $50. Perfect for anyone who needs a portable fan, which doesn’t sacrifice durability or power (that much). It’s not the sturdiest or, with its two-speed functions, the most user-friendly. But with an unbeatable low price tag and the option to operate via battery power alone, this fan is ideal for travel-orientated, on-the-go working. Super stable, and super strong. Just don’t get it wet. This MaxxAir Air Circulator boasts a crazy-strong level of power. While it doesn’t quite match their stated 2800CFM on low and 4000CFM (almost whole-house fan level) on high, this is still a very powerful fan. Though, similar to the OEMTOOLS model, there is quite a contrast between its two speed settings. Low definitely gets the air flowing, whereas high is much stronger. We wish they’d have included a middle ground option. Built to last, the fan is encased entirely in high-grade steel – with a rust-resistant grille up front. The 8-foot long power cord means no worrying about awkward power socket positioning, and being able to tilt the fan up to 180 degrees gives you plenty of alternatives to a simple ‘point-and-blow’ approach. The only aspect which lets this fan down is that the motor isn’t protected from wetness or contaminants. It could probably survive a ton of bricks dropping onto the steel exterior, but a little bit of dampness may be a different story. 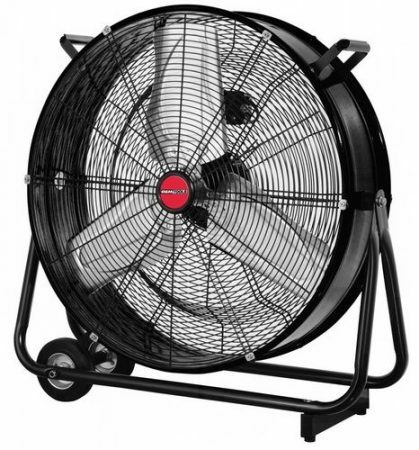 A powerful fan to provide strong circulation for even the largest garages. 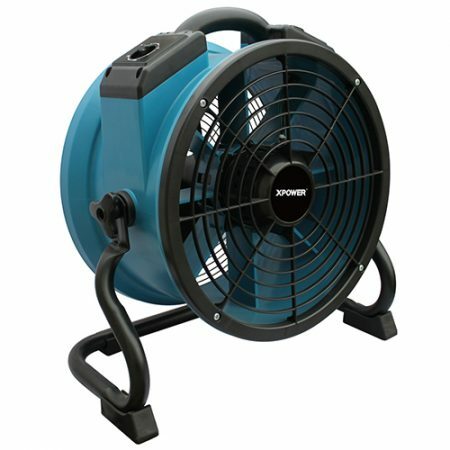 This is a great fan to be used in a static location – especially with the 8-foot power cord. (Provided the fan isn’t being used near contaminants and/or water). If you’re looking for a fan that can provide powerful airflow while being able to withstand any kind of knock of falling object, this is a fantastic choice. Fantastic power and functionality. With the only variable speed dial on this list. The fan pictured above is, at the time of writing, the most expensive fan on this list. Is it worth the money? Yes. If not for one small thing. It’s got everything you could ask for. A well-protected motor, completely variable speed dial (the only one on this list), an auto shut-off timer, complete 360-degree rotation, and it’s pretty damn quiet, too. It’s even stackable – if you own more than one, they fit one on top of the other perfectly. What’s wrong is the fan only comes with a 1-year limited warranty. Despite all of the parts looking durable as hell and paying a higher price than the competition, we only get a year’s protection. Which we think isn’t right. 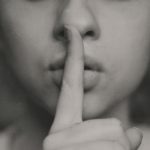 It doesn’t matter if it’s the best product on the market – if you’re charging a higher price, you should put your money where your mouth is and guarantee your customers years of functionality. However, this is still a fantastic product. It would be tied-first, if not for the warranty. But we just can’t ignore that fact. This a fantastic product, but it’s let down by the warranty. If money is no object – then we highly recommend this fan. It really does tick every box that we were looking for. However, our job is to recommend the best value products. So while this fan makes it into our top 5 list, we can’t put it any higher than this. 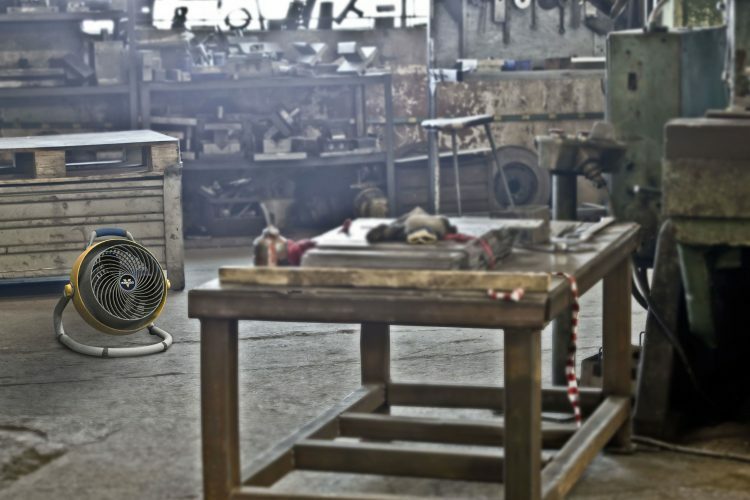 With quality fans like these, there’s no reason to ever be stuck sweating in your garage or workshop again. If we’ve not managed to help you find your new garage fan here, we hope we’ve at least made you more certain of exactly what kind of fan you’re after. When continuing your search, be sure to keep our buyer’s guide in mind when deciding which fan will be ideal for your home. If you have any feedback, we’d love to hear it. Get in touch the via the comments at the bottom of the page, or shoot us a message via the contact page. Thanks for reading! Check out other great ways to keep cool in our related posts below.